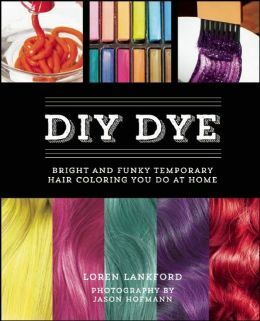 Hair That’s To Die For with DIY DYE – Reader Giveaway! Tired of heading to the salon every time you want to add some POP to your locks? Or are you over your same-ol’ same-ol’ hair color and ready to try something new? If so, you can learn to liven up your hair at home with DIY DYE: Bright and Funky Temporary Hair Coloring You Do at Home. Want an accent streak of fire-engine red? How about forest-green tips? Or maybe you’re daring enough to transform your locks into a rainbow of bright colors? It’s all up to you! Whether you’re looking to add color for a day, week, month or longer, DIY Dye shows you how to fashion the look you want using affordable options like coloring kits, chalks, henna, food coloring and even Kool-Aid packets. If your hair turns out looking as great as this book does, you’ll be extremely happy. The book is filled with colorful, detailed pictures giving you step-by-step help. It tells you the products you’ll need to get started and how to apply them for just the look you want. And there are some awesome little “extras” thrown in like how to make homemade hairspray and how to use natural products like lemon juice, chamomile and cinnamon to help tint your hair. Reader Giveaway: One lucky Jinxy Beauty reader will win their own copy of DIY DYE: Bright and Funky Temporary Hair Coloring You Do at Home. To enter, just complete the entry form below by 11:59pm ET on 3/12/14. Good luck! This entry was posted in DIY, Giveaway, Hair on February 21, 2014 by Chrysa. I need some bright streaks of color in my otherwise dark brown dyed hair and maybe a little yellow just to make it interesting! I am all for color but just don’t have the money to do what I like! I would like mine ombre, I like that! Blonde all the way for me! Let a friend you trust dye your hair for you! I would like to get pink high lights. Thank you for the giveaway!! I love adding a vivid color to my hair. I work in the medical field so when I am at work I try to keep things on the quiet side. I always dye at least one small section just to give my hair that special pop of color. I’d like to do mine with blue streaks for the Undy 5000. Lately I’ve been thinking a pink streak in my hair would be fun. I’d like to bleach it blonde and add brown lolights. I have NEVER dyed my hair. But if I did, I would love to do a deep brunette. I’ve been wanting to dye my hair blue for a while. I found a cool pin on pinterest that had teal, purple and jade all at once, and each section of a french braid was a different color. Very Cool! I just dyed my hair red and absolutely love it! I will start off slowly with a streak or two in the front, and then who knows??! !